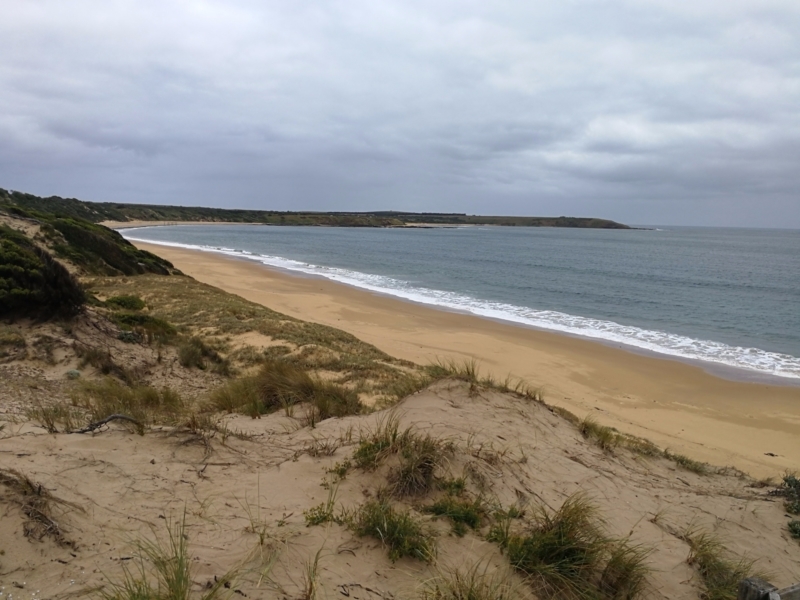 A picturesque stroll along a relatively secluded beach at the western end of Phillip Island, near the Nobbies. 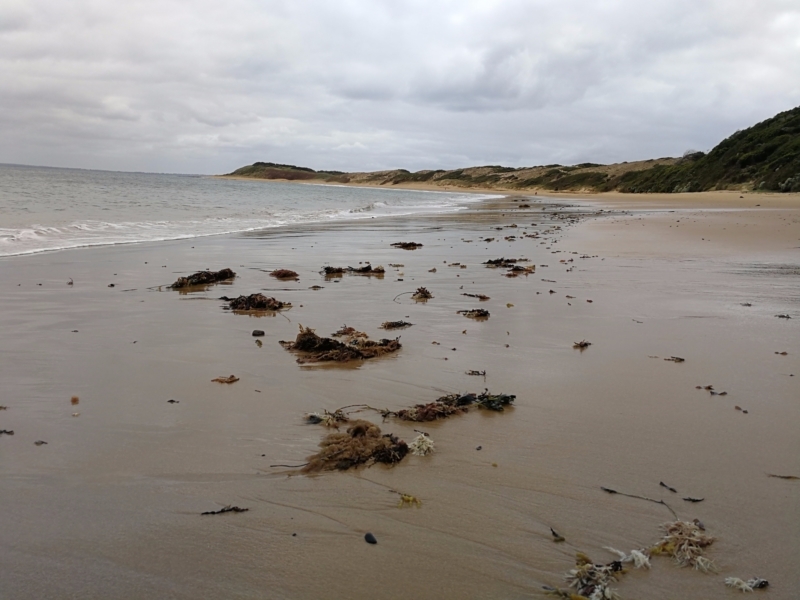 This is a great walk for those who love beach-combing! Flynns Beach is at the northern end of Cat Bay, and is a destination for surfers and those who love to find interesting things washed up at low tide. It can be a great place to escape the crowds at more popular swimming and surfing locations. 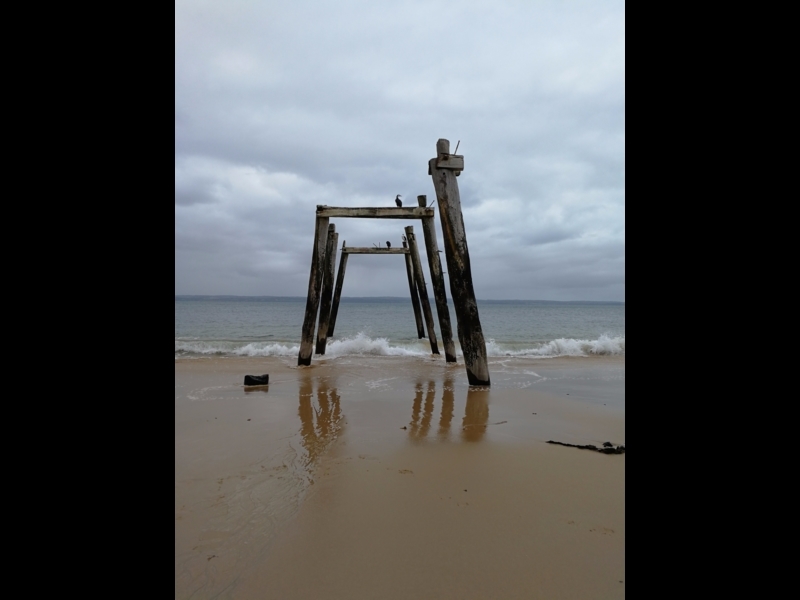 The beach is just 1.3km long, so allow about one hour for a return stroll from the viewing platform / carpark, to the historic jetty and back. 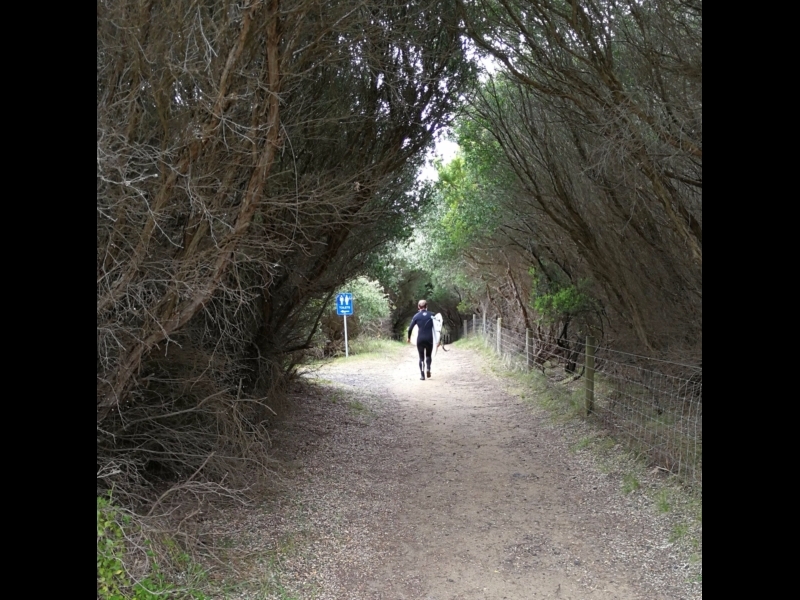 You can access the walk by turning off at the roundabout on Ventnor Road (left for the Nobbies, right for Flynns). This will take you to a car park, and then it's a lovely walk down to the beach along a shaded path. 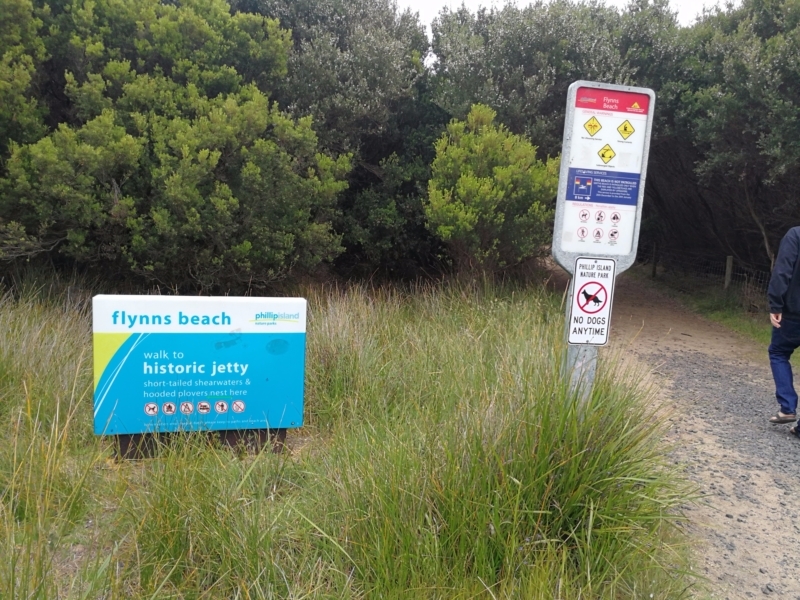 Flynns beach is not patrolled, and no dogs are allowed at any time. There is a toilet located at the beginning of the path from the car park. There are about 60 car parking spots here, but hopefully you've come at a quiet time at low tide! 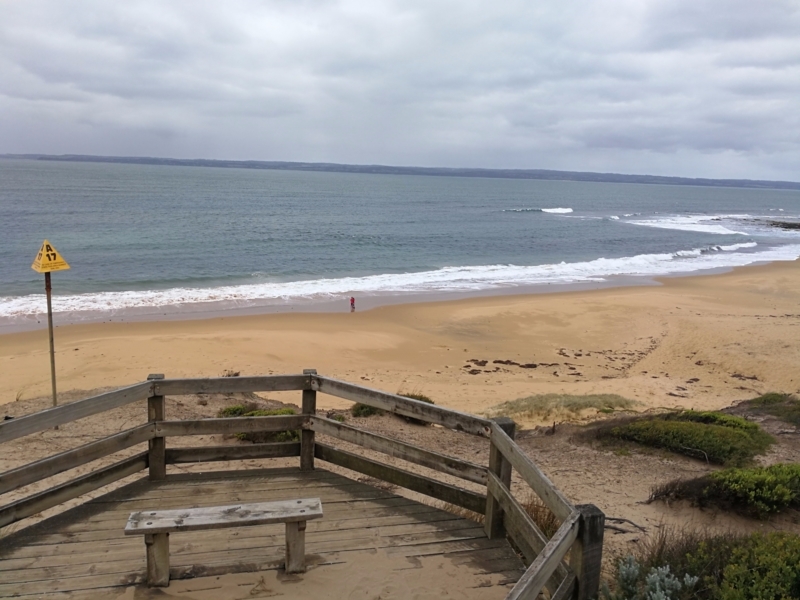 Dogs are not allowed at any time, and the beach is not patrolled by surf lifesavers. There is a long and lovely shaded path down to the beach. A public toilet is located on your left as you head towards the beach near the start of the path. You may, if you're the observant type, notice a few traps on your walk. 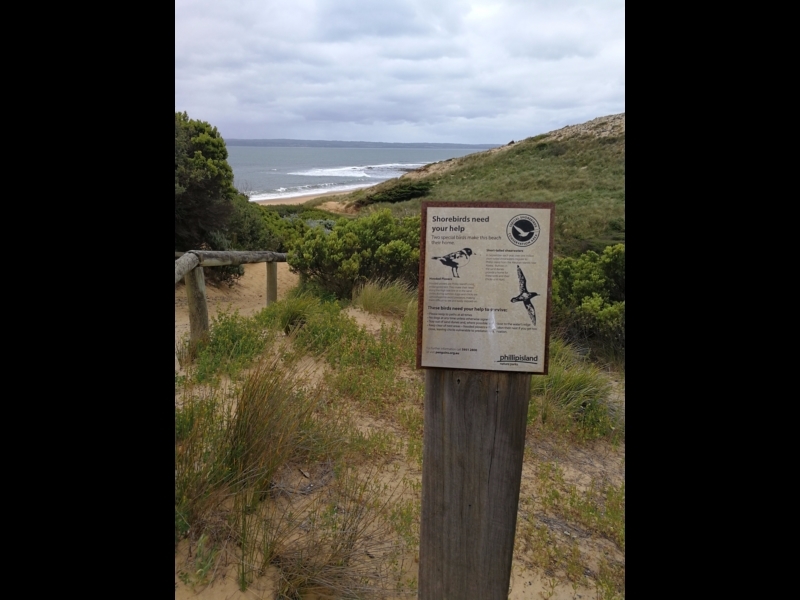 These have been placed by rangers for feral cats, who could threaten native birds and bandicoots, which are being reintroduced. 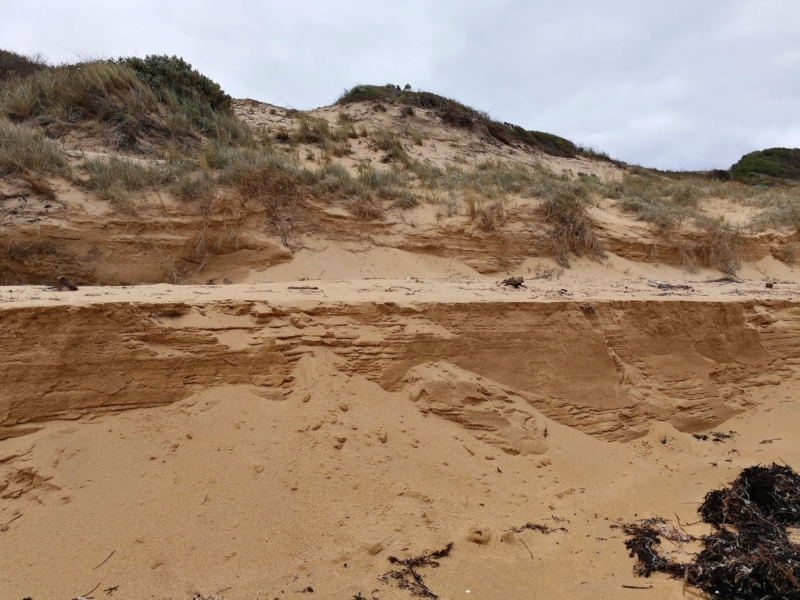 You'll be asked to respect the Hooded Plover and Shearwater habitats, and stick to the beach rather than clambering up the dunes that provide home and shelter for these species. From here you can see the sweep of the Cat Bay shoreline, and on a clear day you might be able to see right across the bay to Flinders. From here take the path down to the beach. 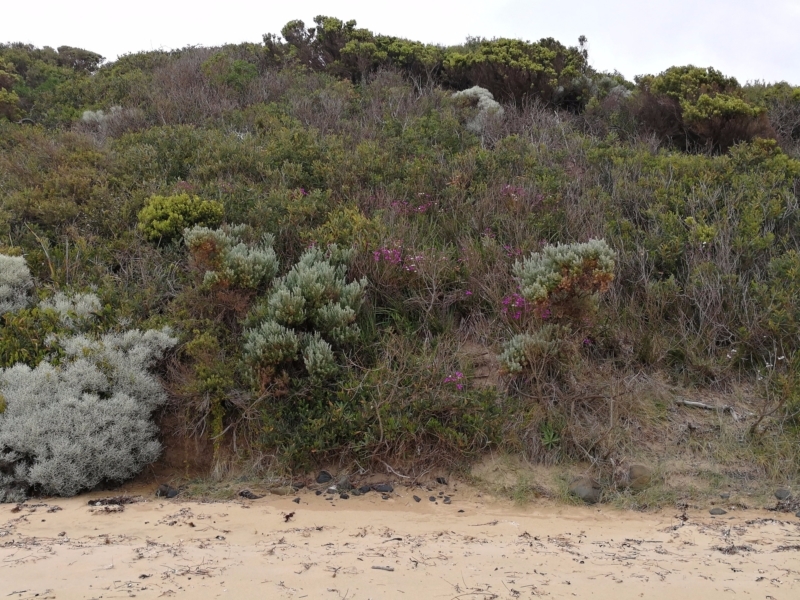 The steep dunes at Flynns are covered in beautiful vegetation. Have a look, but don't be tempted to clamber up as you will disturb the flora and fauna. 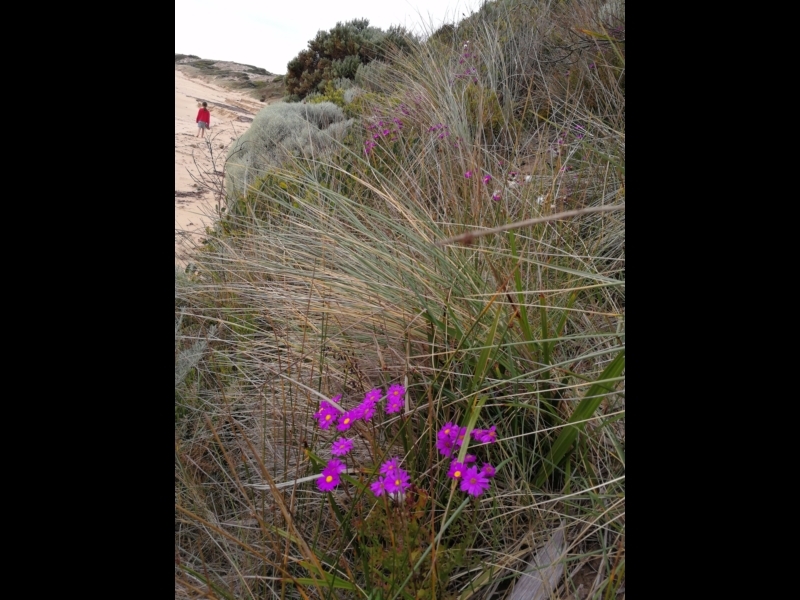 It is unusual to find vegetation thriving in a dune system like this! 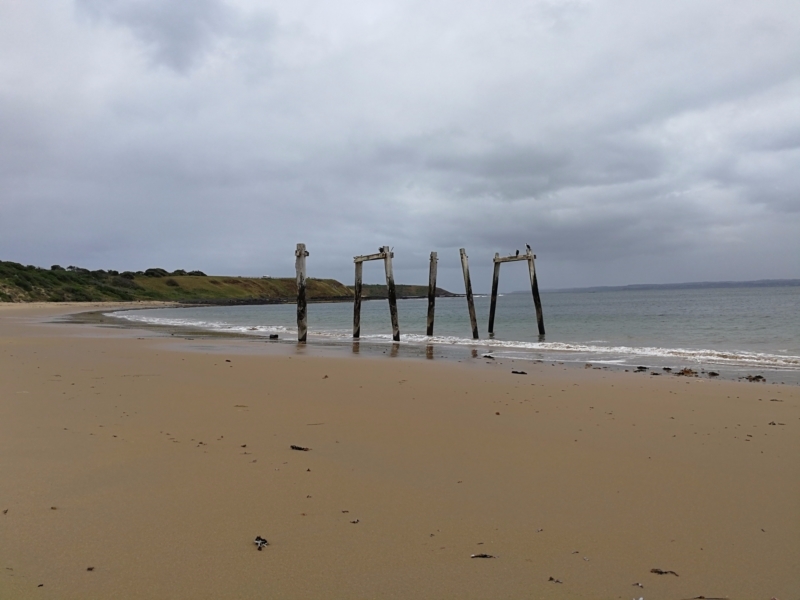 The wooden pylons of an old jetty form a dramatic skeleton. It's the ideal spot to take a photo memento of your walk. The jetty is also appreciated by weary cormorants and other birdlife as a place to rest. 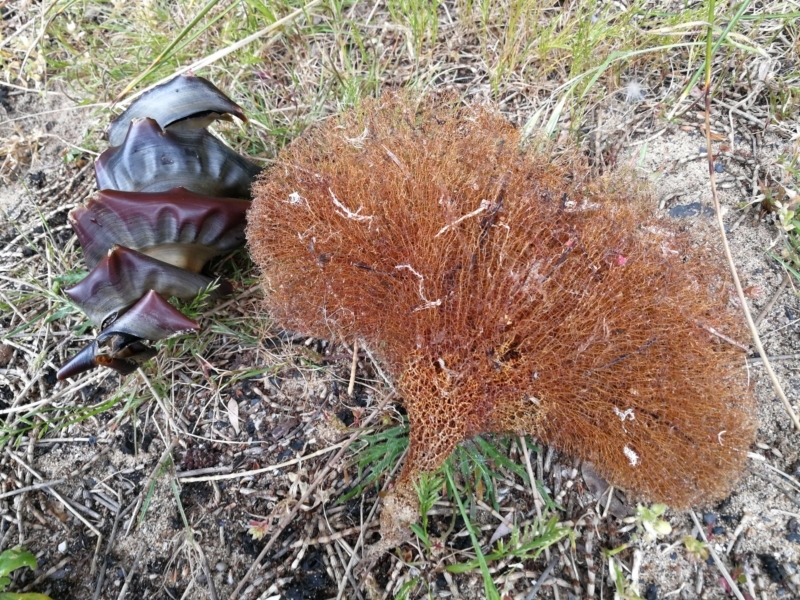 We found heaps of gorgeous sea sponges, cuttlefish and a Port Jackson shark egg on our recent stroll along Flynns. Abalone shells are more common. Look but don't touch (or destroy!) 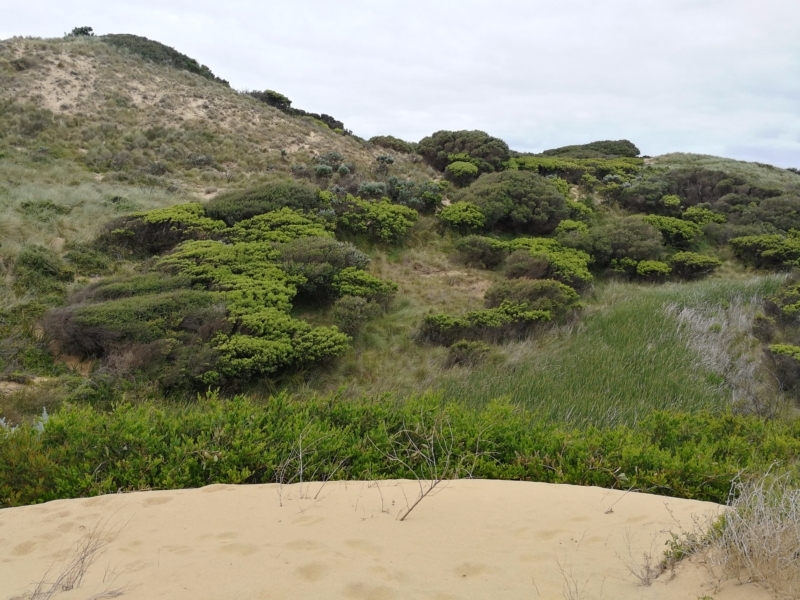 the beautiful dunes towards the southern end of Flynns. As you make your way back towards the path to the car park, take a moment to take in the lovely sites and lush vegetation that marks the entryway. Hopefully you'll enjoy your walk along Flynns as much as we did!